What’s the big deal about cutting boards made in Canada? If you value durability, good looks, and quality, choose a cutting board made from hardwood maple grown in Canada and produced by Canadian workers. When you buy in large lots, you get the wholesale price break. Sometimes called Canadian Rock Maple, hardwood maple is one of the most durable wood species. Its density, sturdiness and resistance make it a logical choice for cutting boards. Maple is the material of choice for baseball bats and bowling pins. That’s because it is dense and strong, able to handle a lifetime of impact. That’s just as true in the kitchen. With the right care, it will give you decades of service in the kitchen. Upkeep is simple. Wash your board in mild soapy water after each use, rinse it thoroughly and let it air dry. Occasionally use natural cleaners like vinegar, hydrogen peroxide, lemon, baking soda, or kosher salt to remove stains and get rid of any lingering odors. It is also the most sanitary choice for your kitchen. Unlike plastic, it has natural anti-bacterial properties that prevent toxins from growing. You can be sure that a cutting board made from Canadian hardwood maple is safe and hygienic, a genuine concern for every cook. Maple keeps its attractive appearance for decades. The unique grain and rustic look makes it a welcome addition to any kitchen. Though you can store one easily in a drawer or cupboard, many cooks like their decorative touch they give and prefer to keep them out on the counter. Canadian hardwood maple is also an environmentally friendly choice. Maple forests in Canada are properly managed and sustainable. The wood itself is considered a fast growing hardwood and a renewable resource. 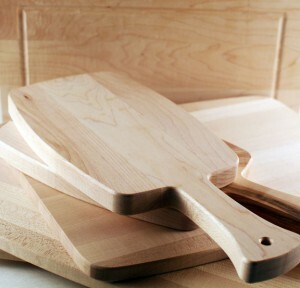 Since your maple cutting board is made from wood, a natural product, is entirely biodegradable. Hardwood maple cutting boards are so Canadian! This wood is intertwined with the national identity. When you buy a board made in Canada, you know what you’re getting. There are very good reasons for the current trend to Buy Local. When you purchase cutting boards made in Canada, you know where they came from. You’re not dealing with a multi-national conglomerate. The workers who make your boards are paid well and work in safe surroundings. The profits help fuel the local economy. Because the wood is sourced locally, these boards leave a reduced carbon footprint. Less transportation and fuel is involved getting the wood from where it is grown to where it is fabricated into cutting boards. Canadian-made goods have a solid reputation for quality and durability. These cutting boards aren’t mass produced junk produced by outsourced labor. They make they most of local resources. And the money you spend circulates locally. Worried about cost? You get quality at an affordable cost. Buy in wholesale lots to significantly reduce your cost per board. You still get the craftsmanship of the Made in Canada label and the durability of Canadian hardwood maple, but without sticker shock. Companies know that customers love cutting boards as buying rewards. Employees value them for anniversary and incentive gifts. Realtors use them as housewarming gifts for new buyers. If you provide a service and want to reward clients, you can’t do better than a wood cutting board. Do you need a door prize or reward for your sports group or club? Consider using cutting boards. Everyone with a kitchen needs one. Looking for an in-demand wedding favor? Your guests will love a cutting board. When you give people a cutting board, you know it will be used. This isn’t a cheap, plastic trinket that just creates more clutter. It is useful in the kitchen, hobby room and workroom. The maple cutting board you give will keep its good looks for years to come. You can have Wholesale Cutting Boards laser engrave your logo. Every time a customer uses the board, she’ll be reminded of who provided it. This spreads your brand for years to come. Contact Wholesale Cutting Boards today to find out more about our Made in Canada hardwood maple cutting boards.